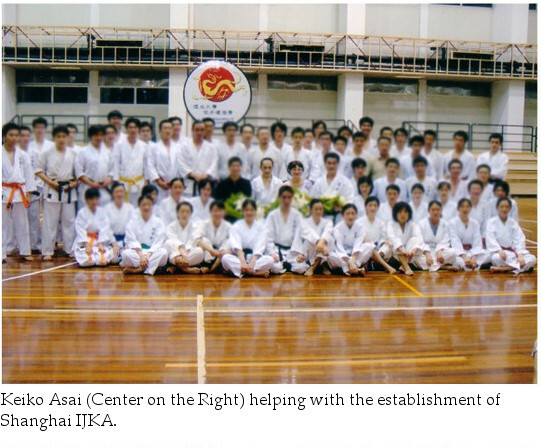 IJKA is established by the late Master Asai in around 1989. It is a new type of karate organization that does not restrict the practitioners to only one school of karate, and incorporates waza from various martial arts. 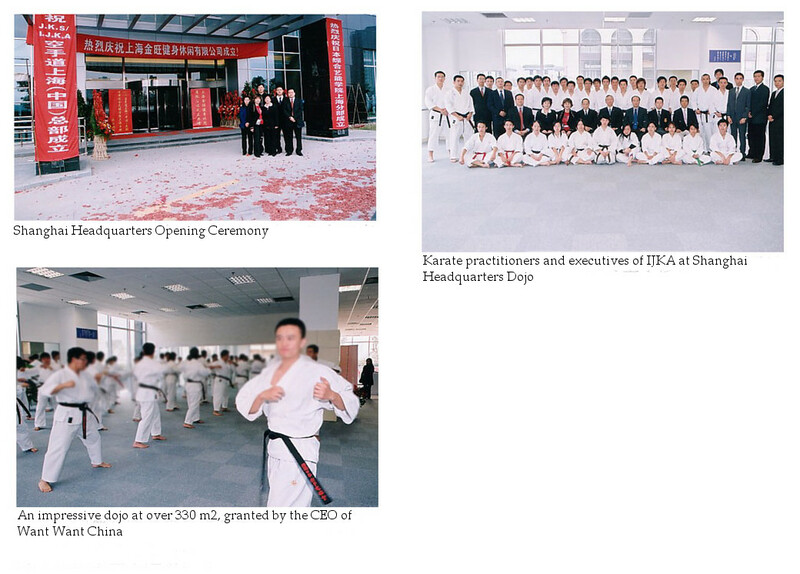 IJKA Shanghai general headquarters (Sohonbu) was established on July 5th, 2004, and its office and the Dojo opened on November 20th, 2005. Below is the record of these events. Group photo of Asai Shihan, members of International Japan martial arts Karatedo-kai (IJKA) and its Shanghai headquarters, the chairmen of 髢｢髮ｲ鬚ｨ莨啾nd 髢｢菫雁ｹｴ, the chairmen from karatedokai of Fudan University, Shanghai University, Tongji University and other universities, members and the dojo head of Shanghai, instructors and students. On August 15th 2006, Master Asai passed away. After his funeral, members of IJKA from around the world visited our home, and talked about the future of the organization. Everyone requested that I take over, but it was so soon after Master Asai窶冱 passing and I could not bring myself to do so at the time. In November 2006, I was invited to Master Asai窶冱 memorial camp in Switzerland, by Mr. Bruno Koller. For many years, Master Asai held a yearly technical seminar and camp, and members such as Mr. Bruno Koller from Switzerland, Mr, Otto Riedinger from Germany, and Mr. Giuseppe Formenton from Italy joined and many others from various countries trained under Master Asai. So that year, the regular karate camp became a memorial camp. After the camp, we held a meeting and encouraged ourselves to continue to protect Asai karate, and concluded that I would succeed IJKA. However, still psychologically quite damaged by the loss, I could not do much at the time. Many people continued to visit me from inside and outside of Japan, and with their warm support, by 2008, I was able to slowly start organizing myself. On March 8th, 2010, I have succeeded IJKA and reestablished the organization. Since then, we have been making decisions as a group as seen below based on Master Asai窶冱 policies, so as to avoid consolidating power to a few individuals. IJKA did not split into two separate groups. IJKA is an unique organization established by the late master Asai that is open to all schools of karate and has incorporated techniques of many different martial arts. For that reason, following the Japanese tradition, IJKA is the Soke. Master Asai is the Kaiso of Soke, and Soshi of Asai karate. The places he taught such as these in England and other areas are Bunke. After Master Asai窶冱 passing, there became a vacant spot in Europe for teaching the karatekas coming from all over the world wishing to learn Asai Karate. A former assistant of the Master, who we lost contact with for a long time returned, declaring he has 9 dan, and started teaching the karate created by Master Asai. but since I have never been contacted by the organization he is at, I cannot place my judgment on the situation. I am just observing from a distance. Currently, IJKA has its honbu dojo in Taiwan Taipei Tetsuhiko Kan. Under the guidance of Shuseki Shihan, Chen sensei, along with European head Mr. Bruno Koller, Italian Chief Instructor Giuseppe Formenton, Germany Chief Instructor Otto Riedinger and other international instructors in respective countries, we are training peacefully and committed more than ever to spreading Asai karate around the world.